Not too long ago we posted an Instagram story highlighting some of the up and coming trends in engagement ring styles, and we received a lot of feedback asking for MORE info! Love is in the air, as this is proposal season for all those 2018 Summer weddings! Whether you know exactly what you want, you're still not sure, or you just love lookin' at pretty rocks - here's a little bit of diamond ed to get those creative wheels turning. 1. Oval Cuts | Oval cuts lend that vintage, yet highly sophisticated look that every bride wants. Why are they so popular (and on the rise)? They look bigger! It's true - a 1 carat oval diamond looks 10% bigger than the same carat round or princess cut, simply because of the surface area. A quick tip when shopping for oval cuts: You'll want to know if you want yours "Tall or Squat." In other words - a more narrow oval, or a shorter, wider oval? If you're looking to surround your diamond with accent stones or a halo, we recommend a "Tall" oval cut so it doesn't look crowded. 2. Stacked bands | We're seeing a lot less of the traditional coordinating wedding bands, and a lot more mixing and matching. Brides are having fun with custom ring stacks, as a way of highlighting and complimenting (but not over crowding) the engagement ring - which should remain the star of the show! What are the rules here? Well, there aren't many. As far as mixing metals, diamonds, and gems, the rules is: anything goes. The idea here is to have fun expressing your own unique style and love what you see when you look down. Fun fact? In Scandinavia - it's actually typical for women to wear 3 stacks! One for engagement, one for marriage, and one for motherhood - Union approves this trend! 3. Rose Gold | Rose gold has that warm, romantic feel that sets it apart from other golds. And yes, it's true - rose gold is actually more affordable than white or yellow because copper (used to make rose gold) costs less! It's also the most durable gold, making it tougher and less likely to get scratched or dinged. Both guys and gals are diggin' the rose gold this season because of its versatility and durability. Also in right now: mixing golds! 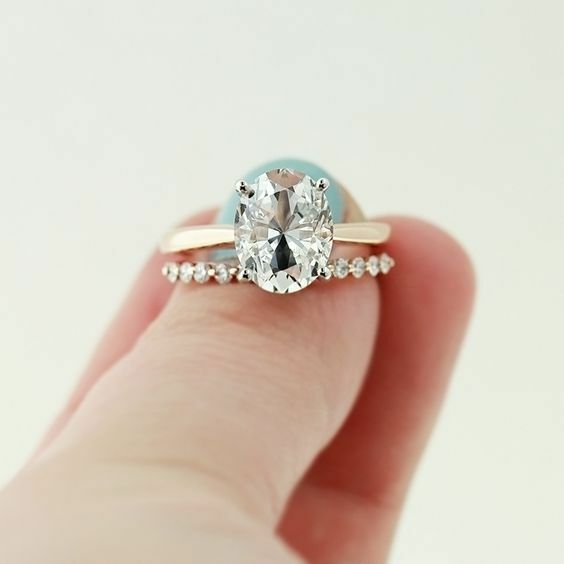 We're seeing lots of white gold engagement rings, for example, paired with rose gold bands. 4. Colored Gemstones | We saw it in wedding dresses last season, and we're continuing to see the trend rise in rings - color! 'Cuz why not, right? Thanks to celebs like Carrie Underwood and her canary yellow diamond ring, classic diamonds have some serious competition! Some popular gems we're seeing used include sapphires, emeralds, and morganite. But since diamonds will always have so much significance when it comes to marriage, we're seeing these colored gemstones set in accent diamonds for tradition's sake. 6. Pear Cut (Or Teardrop) | Consider yourself on the more edgy side when it comes to style and taste? A lot of brides are digging the pear-cut styles, a cut that tends to be considered more 'trendy' and fashion-forward. Katherine Heigle, Victoria Beckham, and Jessica Simpson all rock the pear shape. Keep your eye out for these trends, and feel free to say hi if you want to chat quality, custom Jewelry. There's nothing we love more than creating unique pieces with you in mind.